This next set Calisthenic Exercises usually follows our Point to Point and Ellipse warm ups. Things to note, sketch on big paper (I used cheap Newsprint 11 x 17), keep loose and free (some people like to start with a ruler, but you have to work your way towards sketching freehand straight lines), and most importantly work on that mileage (practice, practice, practice). 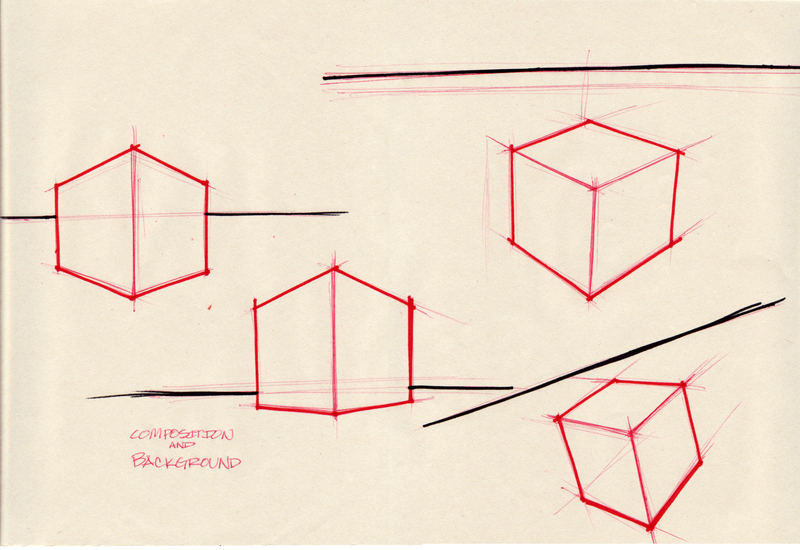 I am quickly going to go through this for your times sake (if you want more detailed notes on constructing a box I suggest a perspective drawing book). The book I used for reference is “Design Sketching” by Erik Olofsson and Klara Sjolen (this book is from Umea Institution of Design and is worth its weight in gold, filled with inspiration). 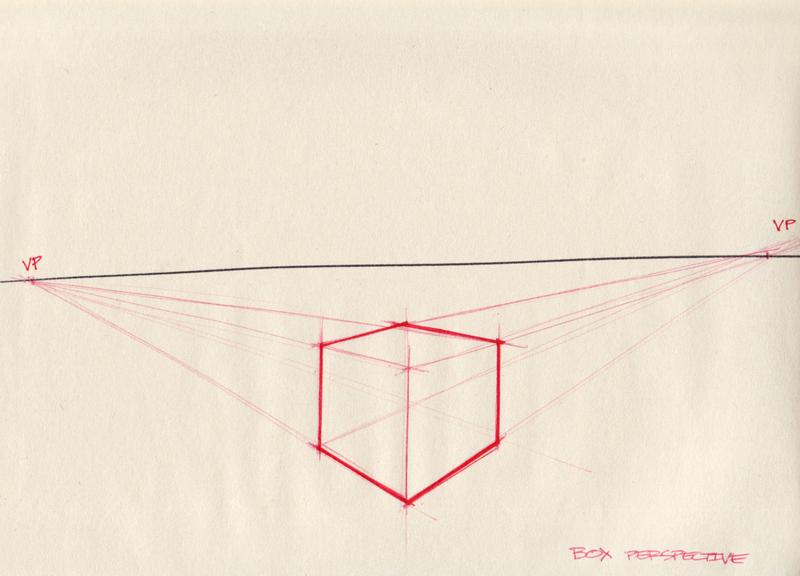 So here’s a basic construction of a box in two point perspective. Notice how the vertical lines on the box are parallel to each other and perpendicular to the horizon line (black line). 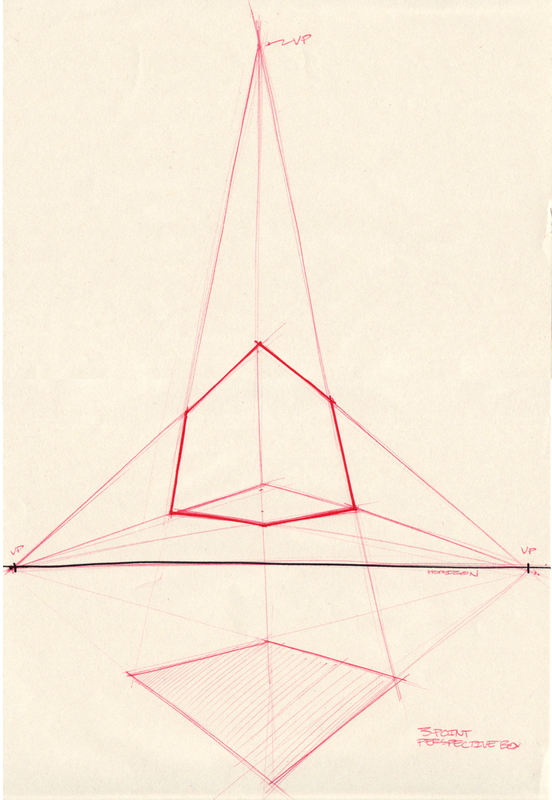 The “horizontal lines” are not parallel, but meet at a specific vanishing points (VP) on the the horizon line. Warning: Placing your vanishing points to close together will result in a distorted or warped perspective. 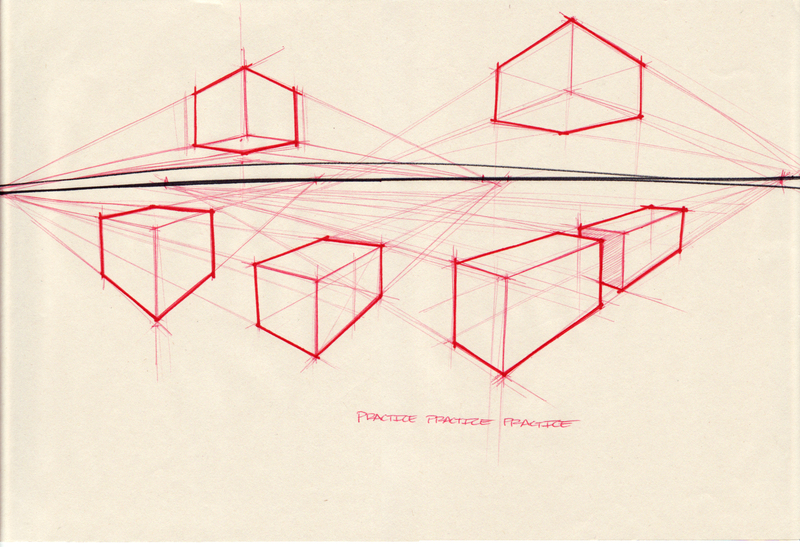 This perspective is based on the same principles as the above box demo (two point perspective), but it includes a third vanishing point placed above or below the object. Your vertical lines now converge at this 3rd point. 3 point perspective will make a small object appear closer to the viewer’s eye or a large object seem monumental. 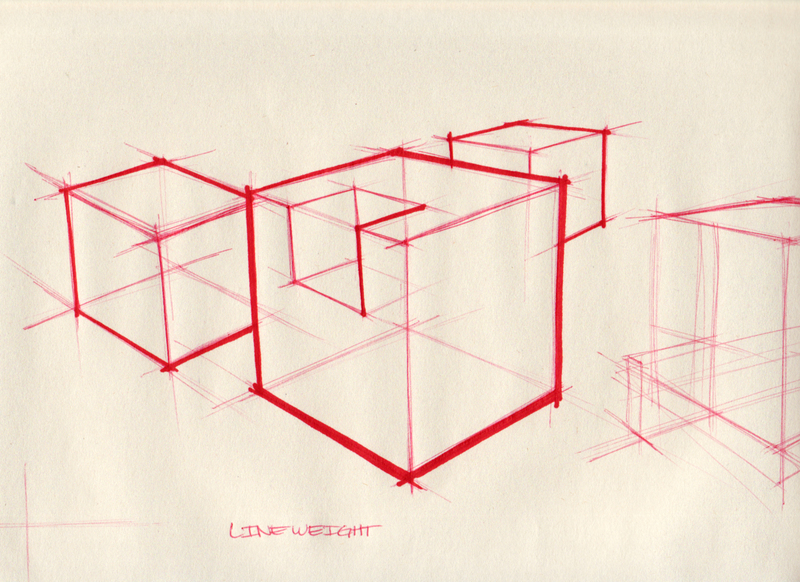 So, after understanding the basics to constructing a box in perspective, this was a warm up exercise we used to do in class. Basically, fill the page with boxes drawn from the same horizon line (Black line). The key is to do this free handed (if you practice your calisthenics of Point to Point everyday, drawing straight lines will come naturally)…this might not be the most exciting thing in the world, but it trains you to dial in the perspective. Another key takeaway is to alway, always draw through your objects, be it boxes or cars. Show your construction! When choosing a perspective, it is crucial to not only consider which viewing angle will best explain your object, but also what feeling you want to convey. 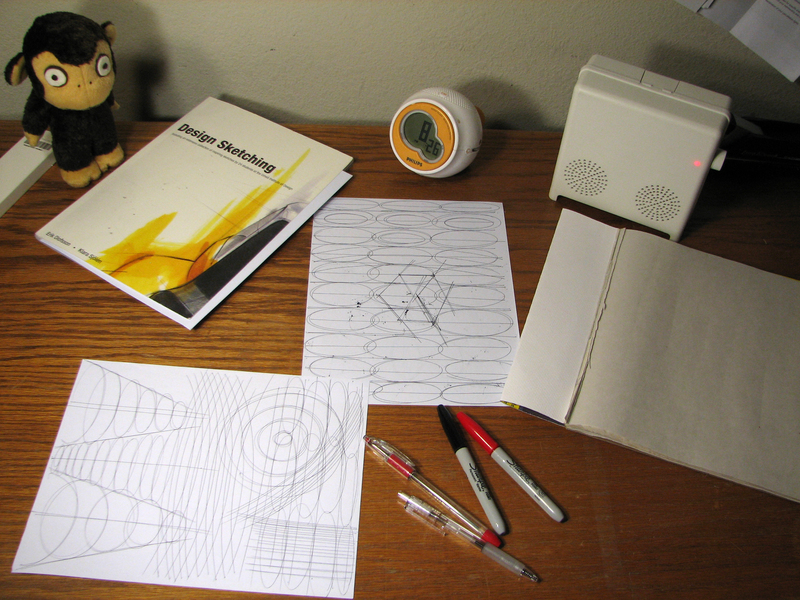 For instance, just by changing the horizon line to oblique, your sketch will look more dynamic. A low horizon gives the feeing of high and mighty (used a lot in sketching buildings). Whereas a bird’s eye view gives the view a feeling of survey and control. Thanks for checking out the demo! Hope this demo and exercise helps…or at least is a refresher and gets you doing warm ups…for myself, I keep my calesthenics under 8 minutes, no need to get carried away…just gotta do it everyday! weblog and wished to say that I have truly loved surfing around your weblog posts. Добрый день. Наша благодарность за интересную статью. Один из лучших сайтов рунета. I as well as my friends were found to be analyzing the good procedures found on your web site and instantly I got a terrible suspicion I had not thanked the web blog owner for those strategies. My guys are actually stimulated to study them and have clearly been enjoying those things. We appreciate you simply being quite considerate and then for using variety of tremendous tips millions of individuals are really desirous to discover. Our own honest regret for not expressing appreciation to you earlier.